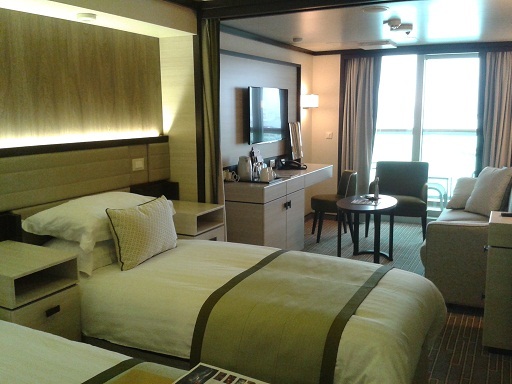 There was something about P&O Cruises’ new ship Britannia which reminded me of Las Vegas, and it wasn’t just the casino. It was partly the vast amount of food on offer on board at its 13 restaurants – the stories about gaining weight on cruise holidays seemed all too plausible – but being able to leave your room and go out for dinner at a restaurant, or to a bar, or to the theatre or a nightclub, all without stepping outdoors, seemed exactly like the hotels of Vegas. But unlike Vegas, which is after all, stuck in the middle of a desert, our own bubble-like world was moving: in our case floating from Guernsey to Bilbao and La Coruna in Spain, and heading home via La Rochelle and Isle de Re in France. As Britannia is so vast, you never get the sense of being at sea, so every morning it was a lovely surprise when you found a different view greeting you from your balcony. It was an almost entirely hassle-free holiday. For a cruising first-timer such as myself, I could certainly see the appeal. I had been rather nervous about the prospect of spending a week on a ship. My perfect holiday abroad would see me heading off into the unknown, reading maps and checking timetables, buying and cooking local food, moving on at a moment’s notice and often ending up somewhere completely unexpected. 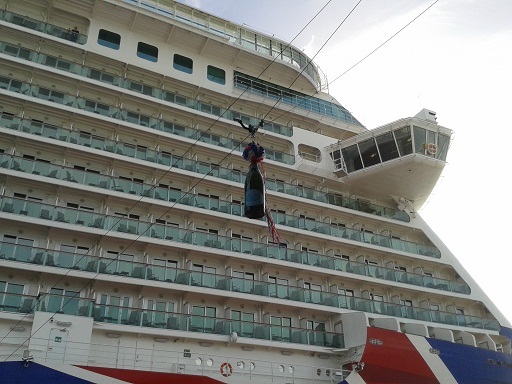 The thought of sharing my holiday with 3,600 other holidaymakers, not to mention 1,400 crew, filled me with alarm. Would there be queues to board, to eat, to drink, to explore? The day was bright and sunny for Her Majesty and Prince Philip as the Royal party arrived to launch P&O Cruises new ship Britannia last Tuesday, a welcome change from the drizzle and rain of the previous day. Before the official naming ceremony took place though, the seated guests (thoughtfully supplied with hand warmers and mugs of hot spiced cordial) were treated to some acrobatic ‘zorbing’, the exuberant Red Hot Chilli Pipers and the Bands of Her Majesty’s Royal Marines and The Irish Guards. 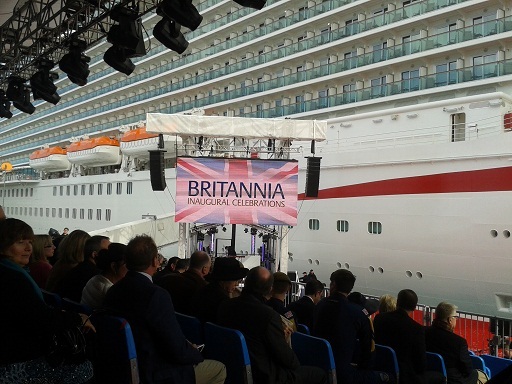 There was a brief speech from David Dingle, chairman of P&O Cruises’s parent company Carnival, a prayer from the Bishop of Southampton, and then the invitation for the Queen to name Britannia from Captain Paul Brown, with proceedings ably and entertainingly MC’d by comedian Rob Brydon. It cost more than £520 million to build, weighs 141,000 tons and will carry more than 3,600 passengers. 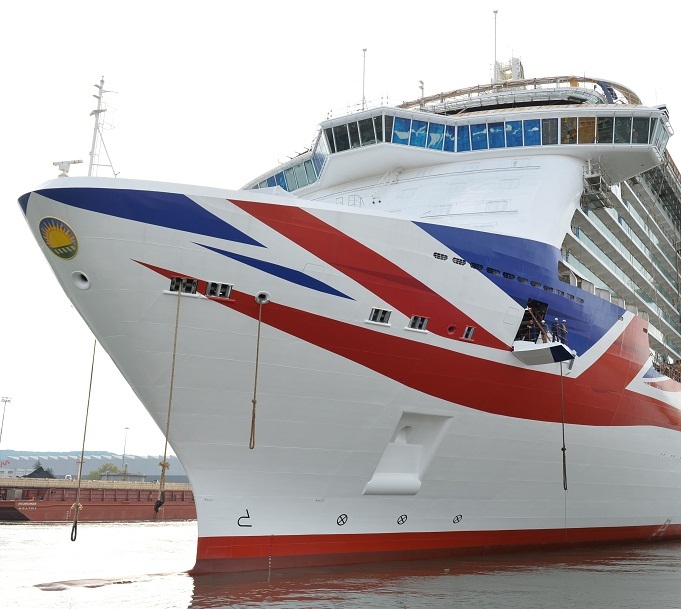 And this Friday Britannia, P&O Cruises brand new cruise ship, will be making her way from the Fincantieri shipyard in Trieste, Italy, to her new home in Southampton, ahead of the official launch ceremony on March 10th. 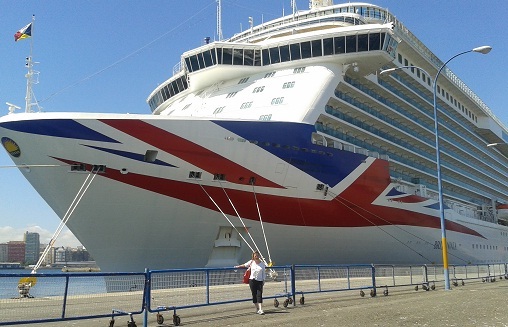 Journalists and travel agents were given a sneak preview last weekend, including a tour round the vessel guided by Britannia’s Captain Paul Brown. 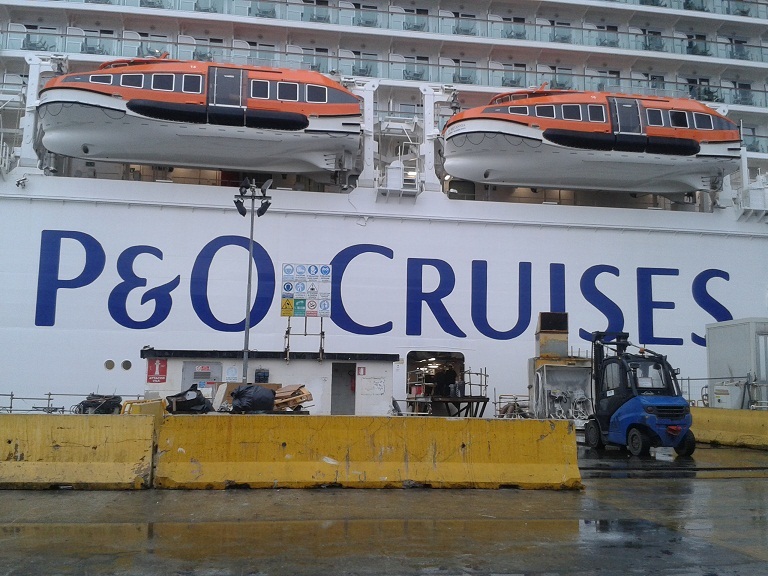 P&O Cruises chairman David Dingle and chief executive David Noyes were part of our group, as were P&O’s new ‘food heroes’ Olly Smith, Eric Lanlard and Charlie Turnbull, respectively in charge of the wine, cakes and cheese offering on the ship.